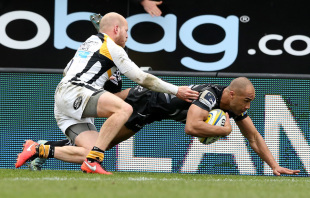 Olly Woodburn touches down for Exeter's first try against Wasps. Exeter climbed above Wasps in the scramble for an Aviva Premiership home playoff after they swept aside their European Champions Cup conquerors at Sandy Park. Tries from Olly Woodburn, his fellow wing Jack Nowell and full-back Phil Dollman underpinned Exeter's emphatic 24-3 victory, which meant they reclaimed second spot from Wasps. Fly-half Gareth Steenson added all three conversions and kicked a penalty, with Chiefs guaranteed a Sandy Park semifinal later this month if they beat Harlequins next weekend, with their playoff opponents likely to be Wasps -- home or away. Wasps, who pipped Exeter in a pulsating Champions Cup quarterfinal clash three weeks ago, looked a shadow of the team victorious on that occasion, and a long-range Elliot Daly penalty proved their only points from a fruitless trip to Devon. Any slip-up by Exeter against Quins, though, and Wasps could swap positions with them, provided they see off the Premiership's bottom club London Irish when the regular league season concludes in six days' time. Exeter named a reshuffled back-row, with Dave Ewers called up at blindside flanker and Don Armand starting at No. 8, which meant that Chiefs' top try-scorer this season Thomas Waldrom featured among the replacements. Wasps, meanwhile, replaced concussed scrum-half Dan Robson with Joe Simpson as their solitary change following last weekend's Champions Cup semi-final defeat against Saracens in Reading. Wasps skipper James Haskell was prominent during the early exchanges, but Exeter quickly assumed a degree of territorial dominance and at one stage went through 16 phases of possession before Dollman was forced into touch. Despite playing into a strong breeze, Exeter maintained a grip on the contest, with Ewers - a strong England squad contender to make next month's three-Test Australia tour - proving a go-to player with his power and clever off-loading. Any kickable penalties Exeter were awarded, they opted for touch to keep Wasps pinned back, and their patience was finally rewarded with a 27th-minute try. The Chiefs pack again made headway, and despite Woodburn having little room to move in, he skipped cleverly outside Wasps wing Frank Halai's challenge and touched down out wide, before Steenson's superb touchline conversion made it 7-0. Exeter thought they had scored again just six minutes later after centre Henry Slade broke brilliantly from inside his own half, finding full-back Dollman, who kicked inside into space, where Chiefs lock Geoff Parling's pass sent Woodburn sprinting clear. Referee Matt Carley, though, rightly ruled that Parling was offside, and disallowed the try, which proved welcome relief for Wasps after they had spent most of the opening 40 minutes in defensive mode. Daly belatedly opened their account with a long-range penalty just before the break, but Exeter's 7-3 advantage meant they changed ends with the elements firmly in their favour. Exeter needed just three minutes of the second period to attempt - and accept - their first kick at goal, with Steenson finding his range from 35 metres to open up a seven-point advantage. Wasps suffered an injury blow during the third quarter when Haskell went off after appearing to suffer a knock around his shoulder area, and Exeter pounced within three minutes of his exit. The impressive Ewers was again Exeter's premier ball-carrier into space, and Nowell worked cleverly off him before enough space was worked for Dollman to go over and touch down, complete with celebratory dive. Steenson's conversion put Exeter 17-3 ahead, and there appeared no way back for Wasps following an opening hour when they made little impact. It could have got worse for Wasps with 14 minutes left when Chiefs substitute James Short chased a kick, and he appeared to have got the touchdown ahead of visiting defender Rob Miller, but referee Carley ruled otherwise following several views of television replays. Nowell then sealed the deal for Exeter, touching down nine minutes from time, and Wasps could have few complaints after delivering one of their least-effective displays this season.